Tim stopped in Nice for a night on his way to Corsica – see below. Oddly enough, Katy was there a week or two later (visiting the same friend) at the end of her trip along the Côte d’Azur. We were very lucky to benefit from inside knowledge here! Our friend took us to an authentic local family-run restaurant right in the centre, which I would have passed by on the basis of its name – the Restaurant d’Angleterre (on account of its location at 25 Rue d’Angleterre). The food is decidedly traditionally French and there is a small outside terrace (though it’s wise to book ahead for that option: +33 4 93 88 64 49). It offers very reasonably priced two-course (16 euros) and three-course (21 euros) set menus as well as à la carte options. 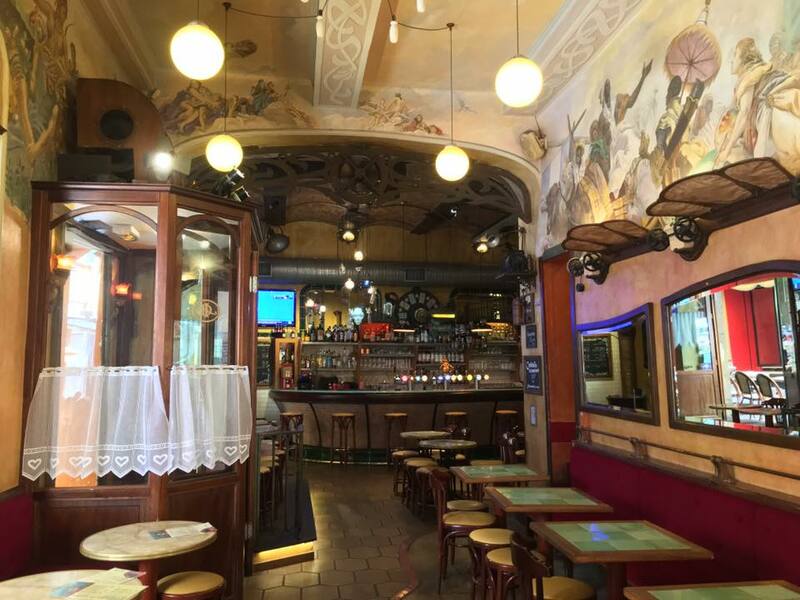 Our friend also took us to a great traditional café in the Old Town, Les Distilleries Idéales at 24 Rue de la Préfecture. Great atmosphere and plenty of outside seating to watch the crowds. Apart from these two ‘finds’, and Tim’s endorsement of Nice, the guide books will suffice. To state the obvious – Nice is, well – rather nice. In general I don’t much like the Côte d’Azur, that very congested and expensive strip of coast in southeastern France, populated by people with rather blingy tastes and leathery brown skin, but I will make an exception for Nice. Although it seems bizarre that it’s now France’s fifth largest city, given that nothing is actually made there, it is nevertheless a real city rather than a holiday resort, and there is enough to see and do all year round. The modern city was built by aristocrats (and there are still lots of right-wingers living off unearned income here) – the British arrived soon after the end of the Napoleonic Wars, with the first Anglican church opening in 1821, and the Russians followed later in the century, Tsar Alexander II visited by train in 1864, as soon as the railway was opened. The Tsarevich Nicholas died here of cerebro-spinal meningitis in 1865 (aged just 21) and a chapel was built in 1867-8, on the exact spot where he died. By the 1890s this was Europe’s premier winter resort, with everyone from Queen Victoria to Nietzsche killing time in the very grand hotels then opening. A typically Russian orthodox cathedral, dedicated to St Nicholas (in memory of the Tsarevich, and funded by Tsar Nicholas II), was opened in 1912, to serve the large number of Russians now resident in Nice. Just five years later, the Russian Revolution meant that many of them were now penniless, counts and dukes driving taxis, for instance, to put food on the table; around the same time the post-Impressionist painters were discovering the light of the south, and Matisse moved to Nice in 1917. At the airport, Easyjet put all the baggage from several arriving flights onto the same carousel, which is yet another cost-cutting idea from a no-frills airline that I would not have thought of. These flights arrive at Terminal 2, from where you can take a free shuttle to Terminal 1 and then walk a couple of hundred metres north to the main road to catch a city bus for €1.50 (including connections to anywhere in the city) – rather than paying €6 for the airport bus to the railway station. From the end of 2018 (although nobody believes this will happen on time) the second line of the city’s tramway will serve the airport, making the cheaper route to the city rather more visible. The first line used a novel battery system to cross the central Place Masséna without unsightly overhead power lines; the new line is actually going to be underground through the centre, which will make it massively more expensive and complicated. 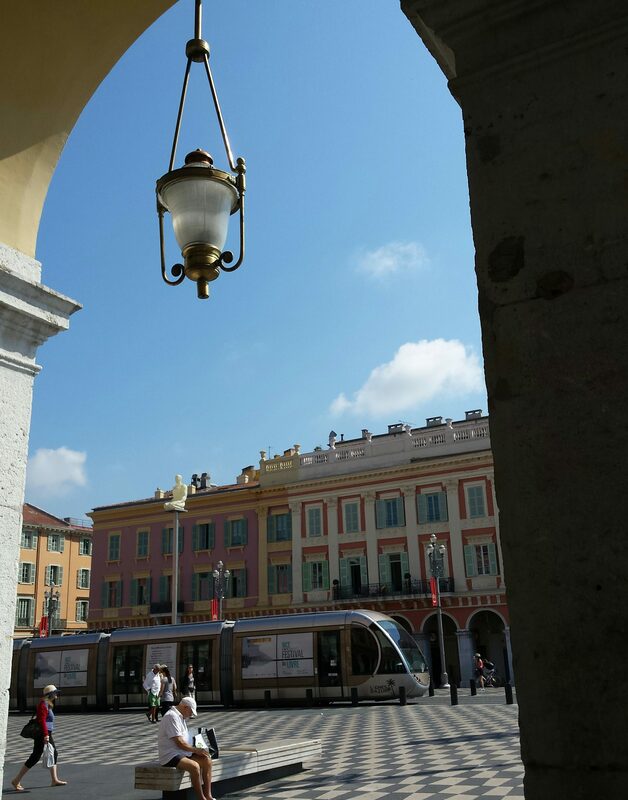 It’s great that the city is trying to move from a traffic-clogged nightmare (like Menton, where I’ll be later this summer) to somewhere with decent public transport (and trams = prestige for most French cities) – though most bus lines still seem to stop running around 9pm. At the Libération stop on the first tram line, it’s worth mentioning the Gare du Sud, the former terminal of the the Chemin de Fer de Provence – a grand Neoclassical pile opened in 1892, with a train shed by the Eiffel company, this was replaced in 1991 by the drab little Nice CP station immediately to its west. It was intended for demolition, but protests eventually led to its being listed as a historic monument in 2002, and eventually refurbished and re-opened as a public library in 2014. Now an underground car park has been added and the train shed will open in mid-2018 as a shopping centre with cinemas and sports facilities. The Musée des Beaux Arts is well worth a visit – the displays upstairs are far better than the dull ground floor – there’s a Rodin Kiss at the top of the stairs, a few Renaissance paintings by the likes of Paolo Veneziano, Martín de Soria and Cosimo Rosselli, as well as the 16th-century Anonyme Niçois, a rare sketch by Victor Hugo and Rodin’s bust of Hugo, some manga books by Hokusai and a 16m-long Chinese scroll of boats on the Yellow River (c.1756). The museum’s pride and joy, however, is its Post-Impressionist collection, notably Dufy and van Dongen, as well as Camoin, Kisling, Bonnard, Laurencin, Signac, Jongkind, Marquet and Guillaumin – there’s also the rather weird local symbolist Gustave-Adolphe Mossa (1883-1971), a bit like Ensor and Beardsley (and at times Klimt), but not as good. The ticket, costing €10, actually gives 24 hours access to all 14 of the Musées de Nice, so I also swiftly visited the Musée Masséna (beautifully restored stately rooms with art and good exhibits on local history) and the Musée Matisse (in a 17th-century villa with a modern basement extension, and just enough art to give a perspective on his long career, though not much that’s really amazing). 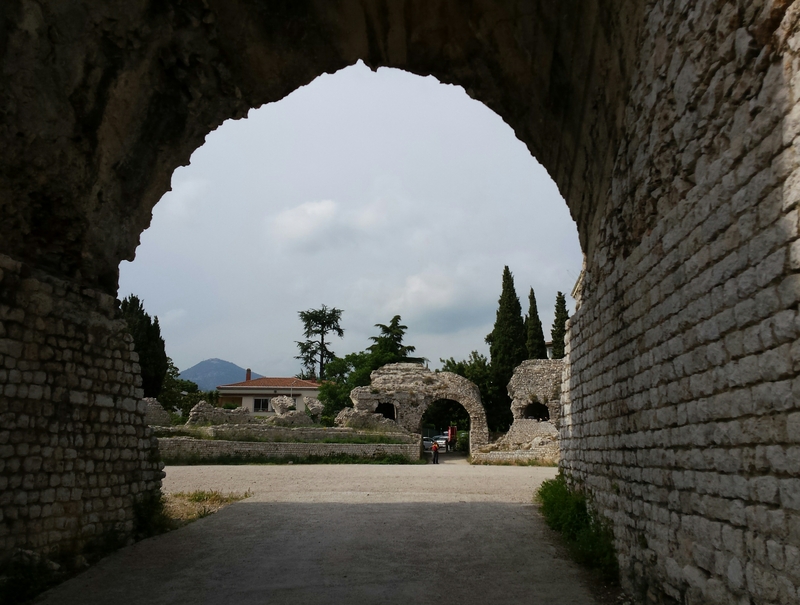 Up in Cimiez, this sits right between the Roman amphitheatre and the Roman baths, dating from the 3rd century AD when this was Cemenelum, capital of the province of Alpes Maritimae. There’s an archeological museum at the ruins, but I didn’t have time to visit. But if you can manage it you really should see the Tropaeum Alpium, a huge Roman monument that dwarfs the village of La Turbie, about 15km east of Nice; this was built c.6 BC to commemorate the emperor Augustus’s victory over the tribes of the Maritime Alps. Apart from the Restaurant de l’Angleterre, recommended by Katy (above), it’s worth mentioning that the most traditional niçoise restaurants often have limited opening hours (often Monday-Friday only, some Monday-Friday lunchtimes only!) and don’t take bookings unless you call in when they’re open. Perhaps the best-known (positively boasting of its limitations) is La Merenda at 4 rue Raoul Bosio (Mon-Fri only, no phone, no credit cards) – but the food is superb, based on local dishes such as stockfish (dried cod simmered in tomatoes, onion & garlic), pasta with pistou (what Italians call pesto), ravioli stuffed with chard, tarte à la tomate, or beignets of courgette flowers. Emilie et ses Cool Kids is a small chain of cafés with two branches in Nice, at 9 rue Alberti (city centre) and 1 rue de la Prefecture (old town) specialising in American-style muffins and bagels – they’re more or less the only places around where you’re welcome to linger for an hour over your laptop and one cup of coffee. We also tracked down La Brasserie Artisanale de Nice at 14 Ave Villermont, where a very pleasant self-taught brewer from Alsace produces a range of just three standard beers (blonde, blanche, and ambrée) as well as seasonal specials – they’re all bright and clean-tasting, with some unusual notes. You can call in to taste and buy Tues-Fri 17.00-19.00, Sat 10.00-noon & 16.00-19.00. But beware of fake LBAN beer, especially up in Sospel, it seems.